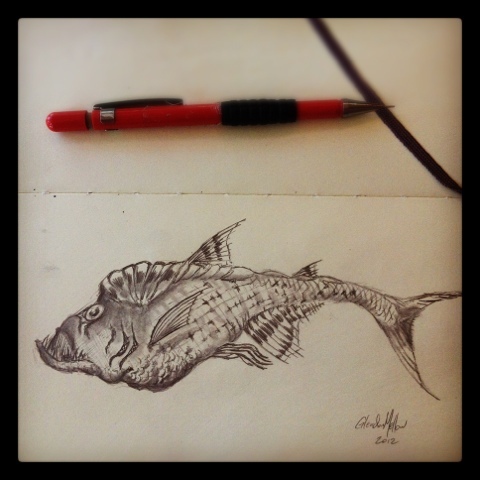 Loosely based on Diplomystus, here's a fossil fish I've been sketching while waiting to pick up my son from daycare. Written by Glendon Mellow On August 29, 2012 In "fish", "fossil", "sketch"
This post originally appeared on the 29th of November, 2008. A scan of my Haldane's Precambrian Puzzle. Oil paint on 9 pieces of shale, 2008. Prints now available. Written by Glendon Mellow On October 25, 2010 In "Haldane", "Trilobite", "fossil", "oil paint", "precambrian rabbit", "reproductions", "shale"
By clicking the shiny, shiny button above, you can follow all the blogs in the Art Evolved group! There's like, 20 of us in the network at present, making paleo-themed art that ranges from scientific illustration to surreal to silly. I've also made a feed widget available to our members, you can see it in my left sidebar (I may move things around though). Written by Glendon Mellow On August 24, 2010 In "Art Evolved", "Art in Awe of Science", "Blogroll", "Trilobite", "art", "dinosaur", "flying trilobite", "fossil", "paleo", "scientific illustration"
One of my personal favourite paintings. Click to enlarge. Below, detail views. Life as a Trilobite Oil on canvas, early 2000's. Detail view also available in my print shop as a greeting card or in a variety of fine art print formats. Originally debuted on The Flying Trilobite here. Tricky to photograph, as I poured stand oil over the surface giving it a mottled, organic look that reflects light strangely. I'm working on some new images with a variation of this character called "Flying Trilobite Boy" - I'm adding wings. Written by Glendon Mellow On April 26, 2010 In "Trilobite", "fossil", "living fossil", "oil paint", "reproductions"